Opened in December 1940, this facility south of the City of Portage la Prairie, in the Rural Municipality of Portage la Prairie, was used for training of pilots during the Commonwealth Air Training Plan (CATP) of the Second World War. 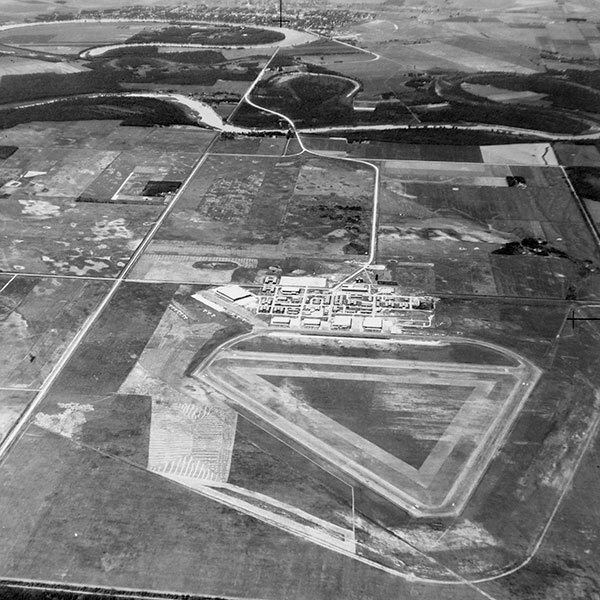 The site was home to two CATP schools: Elementary Flying Training School No. 14 (EFTS) and the Air Observers School No. 7 (AOS). Both schools operated side by side for a time, separated by a narrow road. They shared a 15-bed hospital on the AOS side of the base. The entire facility was built at a cost of $450,000 by the firm of Claydon & Company, with Assistant Engineer E. H. Fleishman in charge of construction. The EFTS base consisted of eight larger buildings including a hangar, ground-instruction school, officers mess and quarters, non-commissioned officers mess and quarters, airmens quarters, airmens mess, stores, and garage. The base also had a 25-yard machine gun range with a 28-foot-high concrete wall. From 28 October to 5 December 1940, it was based at the Air Observers School No. 5 in Winnipeg, under the control of the Central Manitoba Flying School Limited. Training was done with a fleet of 25 Tiger Moths supplied by the Winnipeg Flying Club. 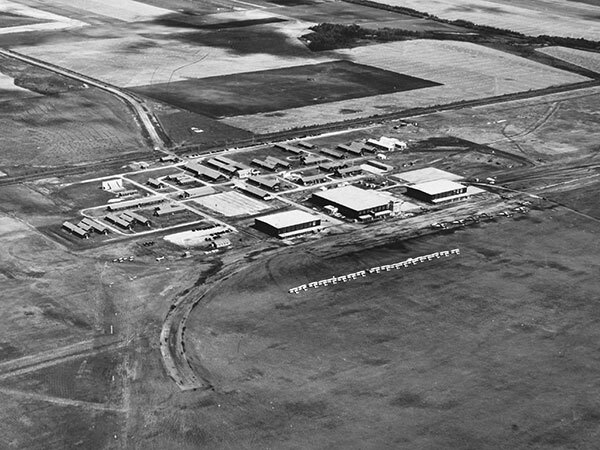 In the summer of 1942, the school transferred to Assiniboia, Saskatchewan and the entire site was taken over by the AOS. The AOS had 12 buildings including a double-hangar (224 x 160 feet), standard hangar, headquarters, officers quarters, officers’ mess, airmen’s quarters, airmen’s mess, combined mess and quarters for non-commissioned officers, workshop, wireless building, direction-finding equipment building, motor garage, and stores. Beginning on 28 April 1941, pupils were given a 12-week regimen of training in air navigation, aerial photography, reconnaissance, observation, mapping, and description. Trainees were flown in aircraft operated by civilian-owned commercial flying companies, under Air Force supervision and instruction. Closed after the war, the site was reopened in the early 1950s and used for training Royal Canadian Air Force and NATO pilots. It became CFB Portage la Prairie in 1966 and was closed, due to military cutbacks, in September 1992. The site is still used for civilian aviation. “Portage Air School will open Oct. 28,” Winnipeg Tribune, 17 October 1940, page 13. “Portage race,” Winnipeg Free Press, 19 October 1940, page 3. “Portage Elementary Flying School receives finishing touches,” Winnipeg Free Press, 19 October 1940, page 3. “Flying School opens Monday in Winnipeg,” Winnipeg Free Press, 25 October 1940, page 4. “Off to Portage,” Winnipeg Tribune, 5 December 1940, page 13. “Air School to open soon at Portage,” Winnipeg Free Press, 18 April 1941, page 3. “Portage Air School will open Monday,” Winnipeg Free Press, 24 April 1941, page 3. “New Air School at Portage loses no time in starting,” Winnipeg Tribune, 28 April 1941, page 11. “Busy Portage,” Winnipeg Free Press, 29 April 1941, page 3. “Portage Air School contract awarded,” Winnipeg Free Press, 3 May 1941, page 22. “War contracts for Winnipeg,” Winnipeg Tribune, 9 September 1941, page 16. “Portage Flying School holds anniversary,” Winnipeg Free Press, 8 November 1941, page 3. “Mediterranean pilot takes Portage post,” Winnipeg Free Press, 4 June 1942, page 3. “Portage Air School moves,” Winnipeg Tribune, 22 June 1942, page 11. “City briefs [Squadron Leader H. Geoffrey Malcolmson], Winnipeg Free Press, 18 November 1942, page 2. “Portage Air School Club holds annual banquet,” Winnipeg Free Press, 3 May 1943, page 4. “Last Portage Air class graduates,” Winnipeg Free Press, 30 March 1945, page 7.